We would really enjoy seeing our wedding reception through your eyes. Please use this camera to take pictures of each other... then just leave it on the table and we'll do the rest. Thank you for sharing this day and these memories." 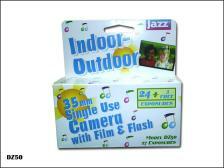 Single Use Cameras, Disposable camera with flash. Wedding Disposable Camera. Suitable for a party, weddings or holidays. 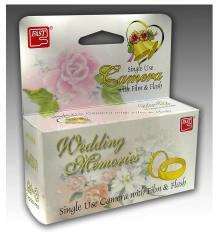 Quality, low priced, disposable cameras. 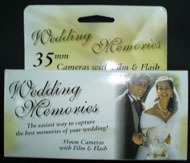 The Disposable/Single Use Camera is ideal for placing on tables at weddings and other funtions for your guests to take photos of events which would otherwise not be seen. The cameras are small, fitting easily into a pocket. No need for carrying a bulky camera during walks, hikes or climbs. Nothing to setup, just point and press. Small and compact. ISO 400 is high speed film. Slower film causes the subject being photographed to blur if it is moving. To improve the light of the subject being photographed when indoors. Cheaper cameras use plastic lens. The glass lens ensures the minimum abberation (false colour).